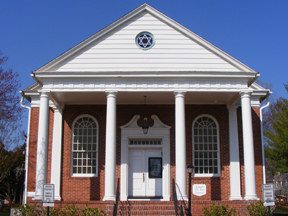 Temple B’nai Israel serves the Jewish population of Maryland’s Mid-Eastern Shore counties: Kent, Queen Anne’s, Caroline, Talbot and Dorchester. During the war years of the 40s, friends from Easton, Cambridge, Chestertown, and other Mid-Shore towns of Maryland got together and formed the Jewish Sisterhood of the Eastern Shore to send personal supplies to our servicemen overseas. They were also involved with other social activities and fundraising. This was an association that eventually led to the building of a synagogue and the creation of Temple B’nai Israel of Easton, Maryland. Money for the synagogue came from members of the community at large, merchants, and the sisterhood. Temple B’nai Israel’s building was dedicated in September 1951; the congregation had approximately 50 members. The remarkable growth of membership in the Temple, led the congregation to hire Rabbi Peter Hyman as our full-time Rabbi in 2009. Now the Temple has over 200 members, many of whom call the Eastern Shore their second home, while they still live in Washington, D.C., Baltimore, Philadelphia, and other nearby venues. Others have retired here and enjoy the life-style afforded by this unique area. Still others are pursuing careers and raising their families here. Affiliated with the Union for Reform Judaism since 2006, Temple B’nai Israel offers religious services designed to meet the diverse needs of its members who come from both the Reform and Conservative Jewish traditions. All services are egalitarian with women as full participants, and non-Jewish family members are welcome on the Bimah.